The MDPI digitization facility is located on the first floor of the Innovation Center in the IU Technology Park on the Bloomington campus. This floor was renovated to house both Memnon and IU Media Digitization Studios and now contains 21 rooms and over 8400 square feet. Please mouse over the floor maps for room descriptions. 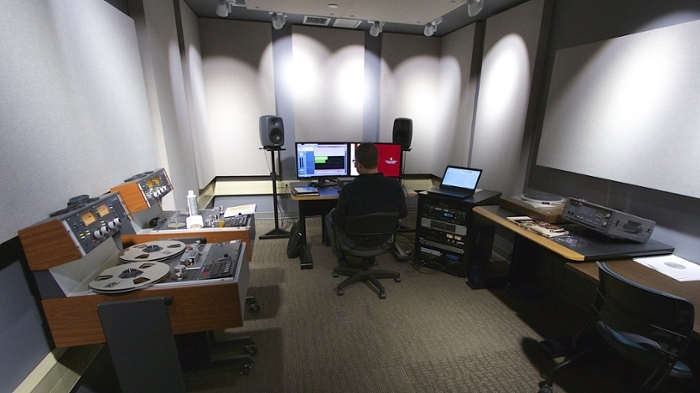 Two identical audio preservation studios are designed for digitization of fragile formats and problem items using a 1:1 work-flow. These rooms are acoustically treated to provide critical listening spaces. They are used to digitize materials such as open-reel tapes, cassette tapes, wax cylinders, unique lacquer discs, and wire recordings. The playback machines, or “legacy machines,” in this room are for obsolete formats. They date from the early 1970s to about the year 2000. The neutral gray color on the walls enables critical viewing; the walls of the room do not influence the video that is seen on the monitor. IU handles certain formats not part of the Memnon work-flow and provides 1:1 transfer work on media too fragile or damaged for the parallel transfer process. IU must certify that files produced by both Memnon and IU operations meet specifications. IU provides quality control on a random sample of the digital files Memnon produces in a day and all film files. Software is used to automate aspects of QC and augment 1:1 attention. Technicians prepare each item for digitization using special tools, such as a microscope or magnetic viewer. They are then passed on to the studios for digitization. MDPI’s first commitment is to preserve the media as they are. The preservation master is as close of a replica of the original material as technology allows. Equipment in this room allows for scanned films to be enhanced to facilitate a better viewing experience. Carefully screened carriers arrive here, ready to be sorted, bar-coded, and entered into the system. Personal electronics are not permitted in the studios as they may compromise the integrity of transfers. Lockers are provided here for personnel. A 50kVA power distribution unit provides clean, dedicated power to playback equipment throughout the Memnon facility. This ensures the elimination of any potential noise in the electrical system. The facility is supplied with three sources of power: clean power for sensitive equipment, service power for other equipment, and separate power for lighting. 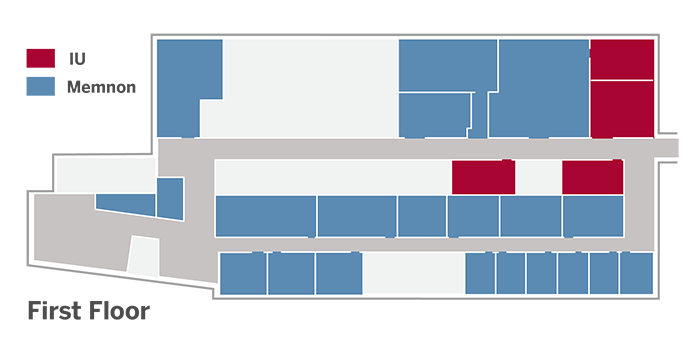 The check-in room is where custody of the carriers changes from IU to Memnon. 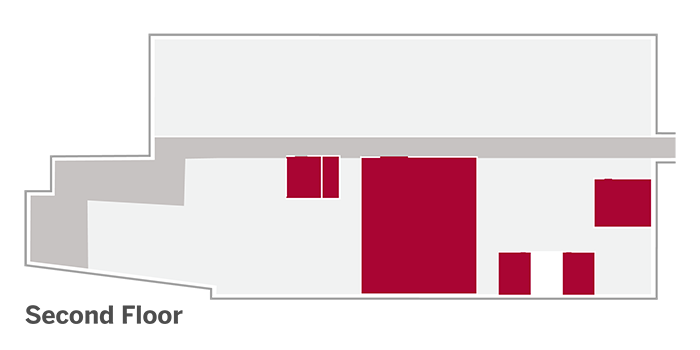 Each carrier is scanned into the Memnon Production Asset Management system for processing. From this point, different carriers follow different paths. 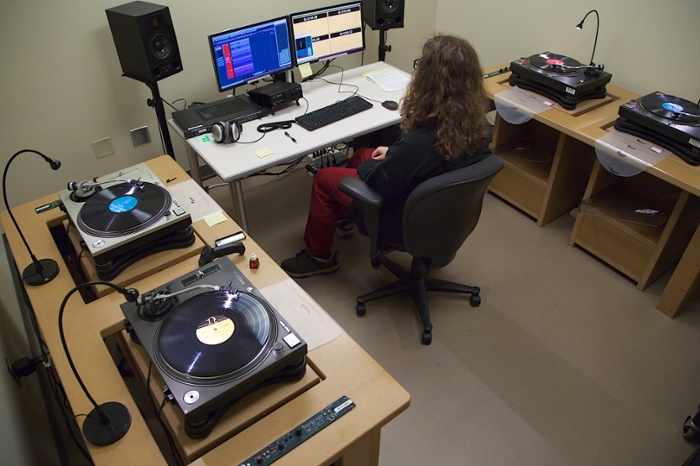 The record digitization studio supports parallel transfers from four turntables at a time. Our turntables have a shock absorber on the inner table to isolate the turntable from vibrations that come from the floor. The outer table isolates each turntable from accidental operator movements. Our DAT(digital audio tape) digitization process can digitize up to 40 at a time. DATs are one of the most at-risk media formats. Damaged tapes are restored in an oven, which resolves most issues with sticky shed syndrome. Special software precisely controls the temperature to ensure the safety of the items. Films are cleaned in the Lipsner CF 8200P to ensure they are free of dust, grease, fingerprints, and glue before sending to the film scanner. Each film is cleaned twice: once manually and a second time with the cleaning machine. Studer machines are used for playback and digitization of open-reel tapes. One operator can manage four to eight Studer machines at one time. High-quality meters on each tape machine enable efficient and reliable machine calibration. The custom-modified head blocks found on each Studer machine make it possible to digitize tapes of different track configurations with a flip of a switch. For cassettes, our operators manage 8 transfers at a time, but could go up to 24. Memnon can adjust the azimuth for each cassette if requested. The imaging room is a flexible space to photograph or scan items to be processed. These could be the actual items or physical metadata associated with them. Records are imaged using a special ring light that allows information cut into the wax to be seen. The video Quality Control (QC) room is painted with a specially selected gray paint to enable the best environment to evaluate the true color on a video monitor. Each QC room has a player similar to those used in production to compare the generated files directly with the physical carrier. All carriers in this room are still considered Memnon Works In Progress (WIP). Every carrier is scanned to ensure that all physical media are returned in the same bin in which they arrived. All carriers in this room have been checked out and are in IU’s custody once more. The items remain here for up to 40 days before returning to the archive. The film studio is designed to be a one-stop-shop for digital fi lm preservation. It is equipped with 5k LaserGraphics film scanners as well as every traditional tool of the trade for film inspection and repair. The large open floor-plan allows for collaboration amongst the staff of trained technicians. Films enter the studio after being cleaned. They are then fully inspected and repaired as necessary to ensure the most stable, pristine scans. 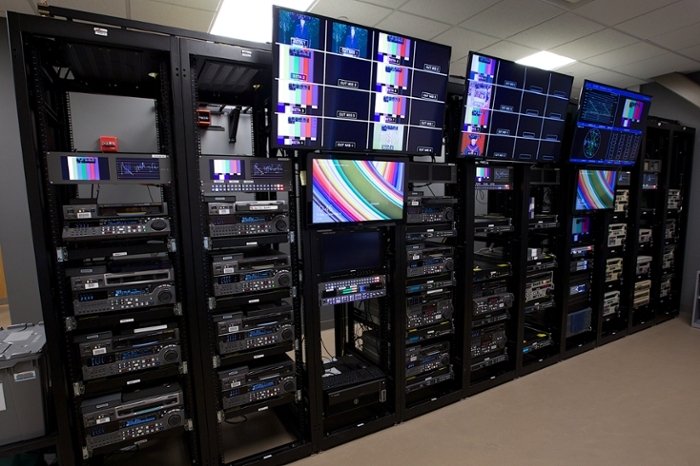 A wide variety of test equipment for both analog and digital video is installed in the racks in this room to ensure the faithful reproduction of all video formats. The 1” C machines were introduced in 1976. Cell phones today provide a much better picture and can play back recordings much longer than the one-hour time limit of the 1” tapes. The ICT room contains the computing and storage capacity to support the digitization process and short-term storage for scanned items. The ICT room is connected to IU’s Scholarly Data Archive (SDA) in the Data Center with two 10-Gigabyte links. The entire process is tuned to allow IU to ingest over 30 TBs a day. The ICT room HVAC has a capacity of 5,000 cubic feet per minute (a normal house contains around 1,000 cubic feet). In theory, the air can be totally replaced in the room every 35 seconds. It’s powered with more than 425 amps — more than twice the requirement for the average home.